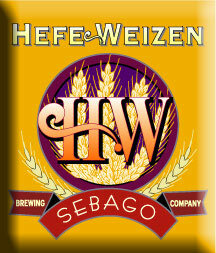 Thanks to a gracious offering from Mark of Sebago Brewing, we were fortunate enough to have two bottles of just-bottled Hefeweizen...bottled ten days ago. Into tulip glasses, it pours a hazy, dark yellow color with a slight orange glow. Topping it off is a fizzy, white head that quickly diminishes, leaving gentle rings of lacing behind. The aroma is at once sweet, contributed by citrus notes, and soapy from the unfiltered yeast. Sweet, fruity esters, with a faint banana presence. Initial taste is sour, accompanied by a blast of carbonation that subdues, giving way to a light, sweet finish. Light to medium bodied, it has an almost creamy texture, which is unexpected for this style. Soft carbonation at the finish. Reviewer's notes: Lemon not needed with this hefe. Lots of chunky sediment from the unfiltered style. Subtle aroma. Reviewed on March 15th, 2007.